It was through an act of technological desperation that I discovered the power of a creative anchor! It was probably the tenth time that somebody had borrowed my iPhone charger without asking but this time my battery had died and I had an important call to make. “********!” I exclaimed out loud, even though nobody was around. “Maybe they thought it was theirs?” I contemplated in a rather more compassionate and forgiving way. I wasn’t convinced! It doesn’t matter where I am, at home, at work, with a client, with friends – people always seem to borrow my charger and after buying 4 of the things I decided that it was time to mark my territory. It just so happened that I was away at an improv residential when this happened so my mind was in a rather more creative space than normal. I’d spent 5 days, from 10am-11pm immersed in performing and watching improvised comedy, improvised musicals and even improvised Shakespear and my little 5 year old creative self was having a whale of a time. I decided to let the child in me be in charge of marking my charger. I decided that the charger needed to look more scary so that people would think twice about picking it up so, on the back of it I drew a scary face. That’ll do the trick I thought and smiled to myself. When I plugged it in I smiled even more as it looked like the plug was grimacing due to the electricity pulsing through it. 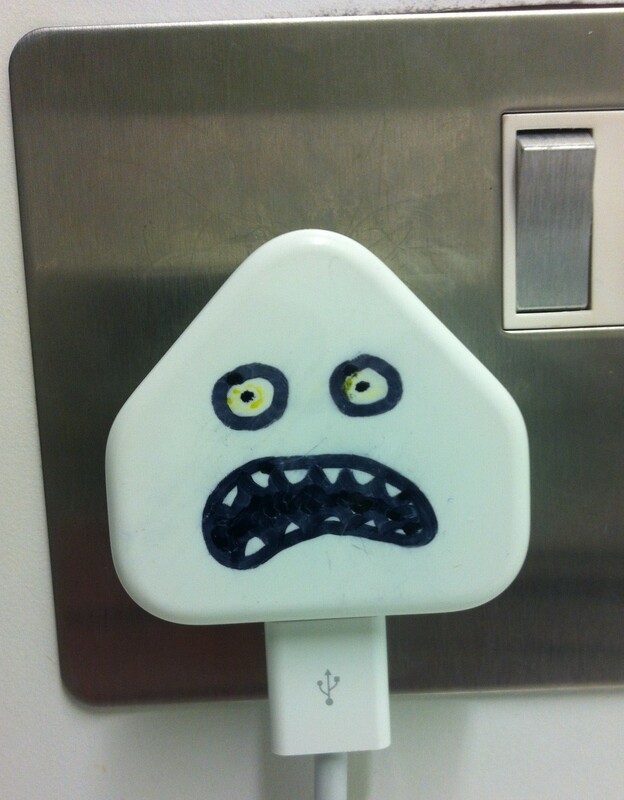 I imagined that its face would relax and smile again when I unplugged it! Back in the ‘real’ world, my adult self was quick to point out that the face doesn’t really scare people off but it does do something else…. Every time people see it – they smile. Every time I see him on my desk – he reminds me that I have a creative child within me. Every time I see him – it makes me want to challenge conventions and norms, to experiment more and to take more risks. Why does a plug have to look all boring and white? Pluggy has become a wonderful creative anchor for me and for others who get in touch with their inner creative child each time they see him. It seems that Pluggy’s power doesn’t simply lie in the 240volts of electricity surging through his head!